This letter from the Energy & Environmental Research Center (EERC) in Grand Forks addresses several recent articles regarding the use of selective catalytic reduction (SCR) technology for NOx control in power plants that utilize North Dakota lignite. Throughout the history of the North Dakota coal-fired utility industry, combustion systems have been designed with larger passages to accommodate the high-sodium ash and minimize the effects of troublesome deposits. SCR technology requires that gases flow through tight passages in order to contact the gas stream with porous catalyst surfaces; this is in contrast to selective noncatalytic reduction (SNCR) that removes NOx but adds no additional flow constraints. The North Dakota utility industry has decades of experience operating its systems successfully on lignite and was rightfully concerned with the potential for plugging in an SCR system. To evaluate this potential, the coal-fired utility industry commissioned a study with researchers at the EERC. The study indicated that SCR technology is not a good candidate for cyclone-fired power plants fueled with North Dakota lignite. In a Bismarck Tribune story on July 21, 2011, titled “State has two-fronted battle with EPA,” federal attorney Brenda Morris was referenced as contending that North Dakota’s determination that SNCR technology is the best available control technology over SCR for North Dakota lignite is based on results from a poorly designed pilot test. However, the outcome of said study (i.e., the plugging of the catalyst) is definitely not indicative of a poorly designed program. The study demonstrates that SCR is not appropriate for cyclone-fired power plants burning North Dakota lignite. The tests were designed by a group consisting of SCR catalyst vendors, utilities, the U.S. Department of Energy, the Electric Power Research Institute, and the EERC. The team of industry-leading experts who conducted these tests utilized state-of-the-art techniques and solicited input from those highly regarded in the field of study and industrial applications. The science indicates that installing an SCR system on a cyclone-fired power plant burning high-sodium North Dakota lignite will simply not work. The North Dakota utility industry should not be required to invest hundreds of millions of dollars in a technology that will force plant shutdowns and fall far short on NOx control. The current state of technology dictates that the clear answer to address U.S. Environmental Protection Agency concerns is SNCR. The advanced Renewable Fuel Standard (RFS2) requires aggressively increasing amounts of cellulosic biofuels to be included in the fuel pool each year, and it is likely that there will be a strong market demand from obligated parties for this type of fuel as blend requirements increase. The current federal Renewable Fuel Standard requires that 36 million gallons of biofuels must be used in transportation fuel by 2022, including at least 21 billion gallons of advanced biofuels such as cellulosic biofuels. This creates a gigantic market for cellulosic biofuels. The U.S. Department of Energy (DOE) has identified a small number of potential intermediates obtainable from cellulosic biomass resources. Levulinic acid, a breakdown product from the acid hydrolysis of cellulose, is one such intermediate and has been studied by the Energy & Environmental Research Center (EERC) and other laboratories. One of the biggest challenges to utilizing levulinic acid as a biofuel intermediate is its costly separation out of the product mix. The EERC in partnership with Mercurius Biofuels has shown in the laboratory that cellulosic biomass in an alcohol medium can be catalytically converted to levulinate esters instead (ethanolysis). These chemicals are also useful for fuels and chemical intermediates. However, a major advantage of forming levulinate esters, as opposed to levulinic acid, is that the ester form is much easier to extract using a simple condensation reaction. Experiments were performed by the EERC using laboratory-scale batch reactors. Tests were done using laminated particleboard, cellulosic municipal solid waste: shredded paper, and pineapple waste; all of which successfully were decomposed to ethyl levulinate. Further processing was done to create higher molecular weight compounds. 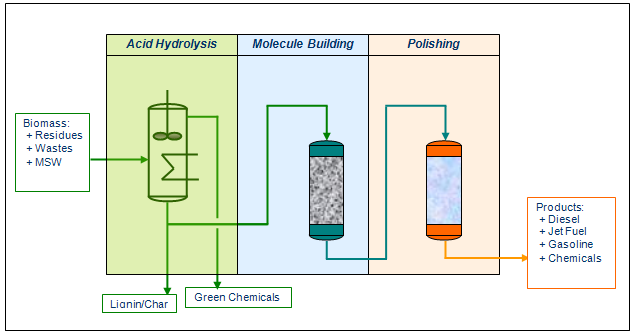 Figure 1 Catalytic hydrolysis process to produce cellulosic-based chemicals and fuels. Subsequent product-upgrading steps will also be conducted in continuous reactor systems, and sufficient volumes of the desired fuel products will be produced so that more extensive fuel testing can be done. The data collected from these continuous production runs will be used to further assess process economics and will also be used for the future design and construction of a larger pilot plant facility. Calculations at this time show that this type of three-step biorefinery will have a lower cost than competing technologies. Capital costs will be lower because residence times are measured in minutes compared to hours or even days for fermentation-based technologies. Also, operating conditions are moderate compared to gasification or pyrolysis. In summary, this biorefinery technology is superior to other technologies because it does not depend on enzymes and fermentation or extreme operating conditions. This technology is more in line with the petroleum refining model and will benefit from many of the same efficiencies. The technology is patent pending for the EERC Foundation and licensed to Mercurius Biofuels on a global, exclusive basis. While the cement industry differs from the U.S. utility sector in many ways, the technologies currently being used or tested for coal-fired utilities are the same as those being proposed by the U.S. Environmental Protection Agency (EPA) to control various pollutants, including mercury in the cement industry. In this regard, many of the lessons learned by utilities can be applied to the cement industry. This article discusses the implementation of mercury control technologies in the cement industry and some of the potential impacts. Mercury emissions from cement plants—as they are from coal-fired power plants—are highly variable and depend on a number of factors. Unlike utilities, the greatest contributor to mercury emissions from cement plants is the limestone rather than the fuel. The mercury concentration in the limestone not only varies from location to location but also within an individual quarry. The kilns used for the manufacture of cement are vastly different than utility boilers. Different temperature profiles and flue gas compositions greatly impact mercury emissions, which means that different types of kilns may result in different mercury emissions both in terms of concentration and type. EPA has stated that in order to meet the proposed mercury rule, most if not all cement facilities will have to install some form of mercury control. Currently, the best available control technology for mercury is considered to be activated carbon injection (ACI). However, as the Energy & Environmental Research Center (EERC) has learned over the past 15 years in its work with the utility industry, the effectiveness of ACI is site-specific. This will certainly be the case for the cement industry as well. Five primary factors affect mercury collection efficiency using ACI and air pollution control devices, and all are interrelated: mercury speciation, temperature profile, residence time, type of ACI used, and flue gas constituents (particularly sulfur trioxide [SO3]). There are two primary types of mercury species that are commonly formed in a utility of cement system, electrical and oxidized. In general, oxidized is much more easily cultured while elemental can be more challenging. A review of the limited published mercury data from cement plants showed that the form of mercury at the inlet of the particulate control device ranged from almost 100% to near 0% elemental mercury, and elemental mercury is more difficult to collect with ACI. The temperature of the flue gas at the activated carbon collection point (baghouse for most cement facilities) is critical. Mercury capture by activated carbon is drastically reduced at temperatures greater than 400°F compared to temperatures closer to 250°F. For existing cement plants, the temperature at the primary baghouse ranged from a low of about 200°F to a high of close to 700°F. The effectiveness of ACI at the plants with high temperatures is borderline at best. It may be necessary to increase the ACI to very high levels or use additives. In either case, it is bound to be more expensive. For the past several decades, the portland cement industry has strived to utilize most if not all baghouse dust by either returning it to the cement kiln or beneficially utilizing it. If ACI is added to the primary particulate collection device, the baghouse dust can no longer be recycled back to an inline kiln/raw mill because it would result in the reemission of the mercury captured by the activated carbon. Also, depending on the amount of activated carbon used, it may limit or prevent beneficial uses as well. This results in a double penalty—increased production costs and increased disposal costs. To ensure the quality of baghouse dust and to maintain the ability to recycle the dust back to the system, a polishing baghouse is required. The activated carbon is added to the polishing baghouse, with most of the return dust collected in the primary particulate control device. Obviously, this will add substantially to the cost of mercury control. Because standard types of activated carbon may not be effective enough to meet the proposed requirements, some cement plants may need to use more expensive treated carbons or enhancement agents. Typically, this means the addition of halogens. In addition to increased cost, there is a concern regarding increased corrosion and erosion of ductwork. Additional halogen may also have an impact on the overall chemistry of the cement kiln dust. Another serious concern that may dramatically impact the effectiveness of either standard or treated activated carbons is the presence of even low levels of SO3in the flue gas. As a result, many utilities are considering adding SO3removal technologies. In the utility industry, SO3 removal technologies usually consist of adding an alkali component, but most cement plants are limited by the alkali content of the product and must meet an alkali limit, so this may not be an option. To effectively control mercury, a reliable mercury emission measurement method is required. Utility experience with continuous mercury monitors has been mixed. Some plants have had good experiences, but others have had tremendous challenges. One plant reported that it had been trying to get its monitor operating consistently since the spring of 2007. To be fair, vendors understand that there have been difficulties, and they are actively trying to reduce or eliminate them. The other method for measuring mercury emissions is the use of sorbent traps (PS-12A). Sorbent traps have been used with good results at a number of utilities, but there are very limited data documenting the problems that may be encountered at cement plants. So what does all of this mean? Federal regulations are going to force the cement industry to reduce its mercury emissions. There is a very good possibility that several kilns will be permanently shut down because the expense to bring them into compliance is simply too high. Research and demonstration projects conducted by the EERC and others at U.S. utilities have shown that the required mercury reductions can be achieved, but to what level is very site-specific. What is not clear are the long-term ramifications and costs associated with achieving and then consistently measuring the levels required by the portland cement National Emission Standards for Hazardous Air Pollutants ( NESHAPS). For example, EPA has made cost assumptions that may not be accurate, in particular regarding the possible need for a polishing baghouse. For most existing facilities, achieving a standard of 55 lb of mercury per million tons of clinker will most likely be possible, but achieving 21 lb of mercury per million tons of clinker produced for new facilities will be substantially more difficult. In summary, each facility will need to incorporate new control devices along with sorbent injection systems to meet regulations, and mercury behavior at each facility will be unique and must be treated as such. There may well be long-term detrimental effects that have not yet surfaced from the use of mercury reduction technologies, including lifetime reducing corrosion and erosion of ductwork and other components. In conclusion, much more data are certainly needed to adequately understand the overall implications of mercury regulation on the cement industry.